How much can you save on your student loans? If you’re ready to tackle your debt, student loan refinancing can help you save money over time. In fact, refinancing can help you save hundreds or even thousands of dollars over the length of your loan. Just how much will you save? You can find out before you even submit your application. 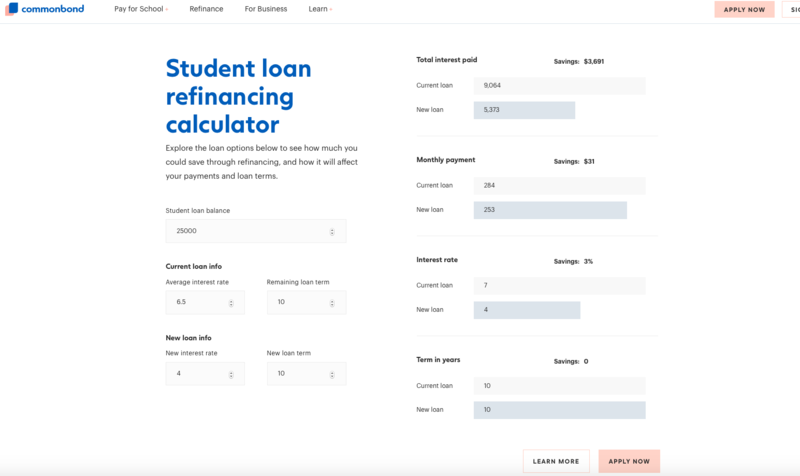 By using the CommonBond refinancing calculator, you can figure out your savings, your new monthly payment, and even when you’ll pay off your debt. If you want to save money or need help affording your payments, refinancing your loans can be a smart strategy. With refinancing, you work with a private lender like CommonBond to take out a new loan for the amount of your current student loans. The new loan has completely different terms than your previous ones, including interest rate, repayment term, and monthly payment. Depending on your income, credit, and what repayment term you choose, refinancing can help you save money or dramatically reduce your monthly bill. You can find out your new interest rate in just a few minutes online. Then, you can use the calculator find out just how much you can save. When you refinance, you can consolidate multiple loans—even federal and private ones— together. That means that, going forward, you’ll have just one payment and one due date, making your loans more manageable. To get an accurate quote, gather together all of your loan information, including the number of loans you have, how much you still owe, and their interest rates. Not sure what loans you have? Check your credit report for free at annualcreditreport.com for a full list of what you owe. If you have multiple student loans, they likely have varying interest rates. To get an estimate, you need to average your interest rates together. For example, let’s say you had two loans: one for $10,000 at 5 percent interest and one for $15,000 at 8 percent interest. Combined, you have $25,000 in student loans. Next, enter your loan details, such as your remaining loan term. If you have a 10-year repayment period and just began repayment, that means you’d enter “10” as your remaining loan term. 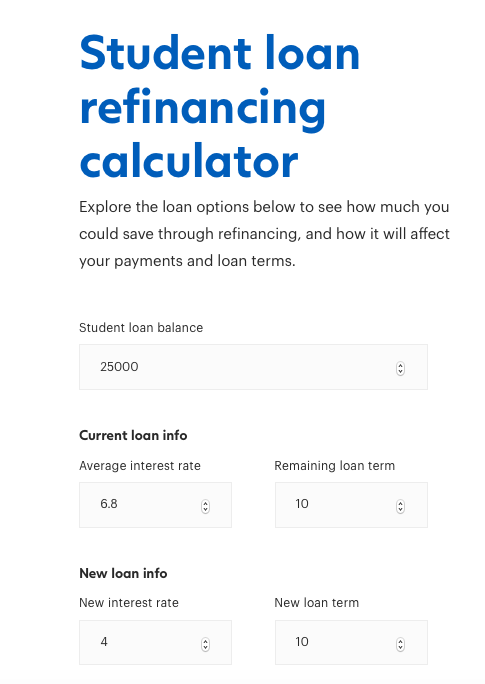 To find out how much you’ll save or how much you can reduce your monthly payment by, enter your refinancing loan details, including the new interest rate on the loan and the new length of repayment. For example, if you qualify for an interest rate of 4 percent and would have 10 years to repay it, you would enter that information in the corresponding fields. Once you enter the above information, the calculator will automatically review the data and give you a quote. It will show you how much you’ll save in interest, how much your monthly payment goes up or down, and how much sooner you’ll pay off your debt. For example, if you refinanced $25,000 in student loans and qualified for a 4 percent interest rate and a 10-year repayment term, you’d save $4,151 in interest charges. Plus, your monthly payment would go down by $35. If you had a larger loan balance—or a higher interest rate—the savings could be even more significant. Once you find out how refinancing can help you manage your debt, you can then apply for a refinancing loan. To do so, just click on “Apply Now” on the calculator screen to begin your application. The application takes just a few minutes to complete, and you’ll receive a decision quickly. 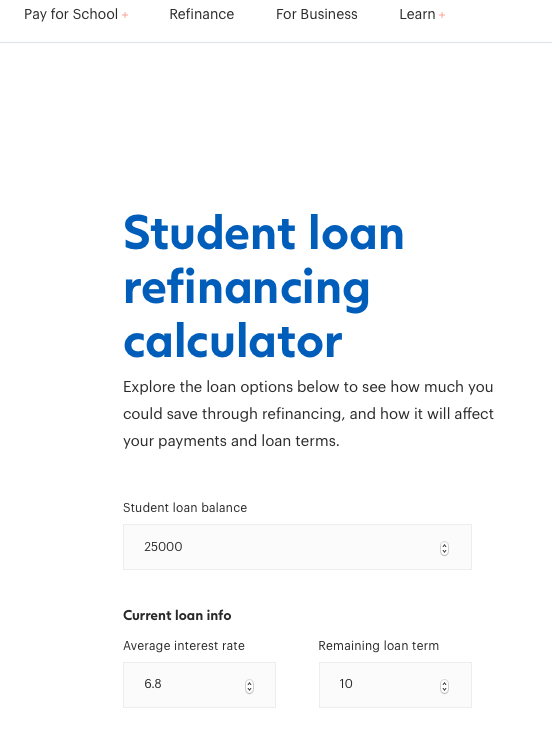 The refinancing calculator is a useful tool you can use to find out just how much you save on your student loans. You can get a personalized quote based on your information, helping you make a sound financial decision. By taking a couple of minutes to calculate your savings and complete the application, you can dramatically reduce how much you’ll pay in interest and become debt-free ahead of schedule.